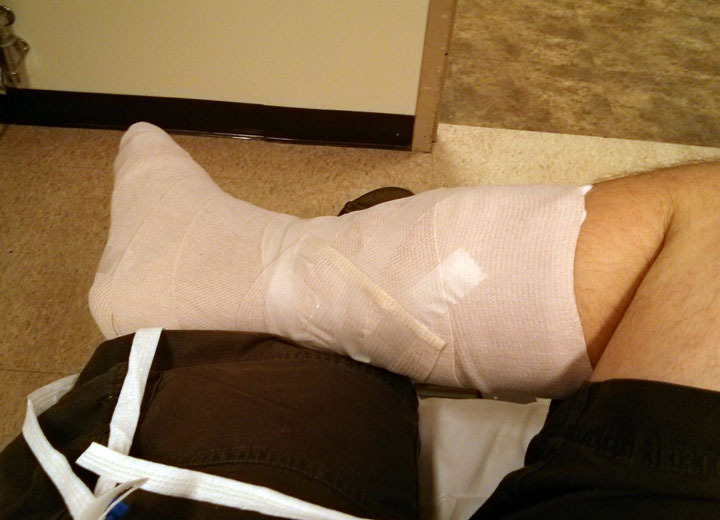 At 23:00 on Tuesday, August 20, 2013 I fell down [all] the basement stairs and ruined my autumn by breaking my foot. Well after dusk, when the sun was down and most people are sleeping, I attempted to go down to the basement (where my "theater room" is) to watch some tv before heading to bed myself. This is an activity I do nearly every night and my routine is largely the same. I pour myself a large glass of soda water and watch some episodes of whichever television series in which I'm currently ensconced. That night, however a combination of clumsiness and darkness conspired to ruin my life for the next five to twelve months. With bread in the toaster and a glass of seltzer in my hand I took the first step down the basement stairs. For whatever reason (I can't even blame it on insobriety) I missed my footing and started down the stairs much too rapidly. Because of the darkness (I kept the main lights off so as to not ruin my night vision and had on only the ambient lighting) I wasn't able to recover from the first tumble. I don't remember exactly how it went, as it happened so quickly, but I must have tumbled over at least once and ended up bringing my entire weight down onto my right foot. The next thing I remember is sitting on the concrete floor, clutching my agonizing leg and letting rip an unending stream of profanities. I didn't know, at that time, how serious the injury was. After several minutes of agony the pain subsided. I hopped into the Odeon, propped my swollen foot on some pillows and set to watching... oh, let's say Star Trek (TNG). After a few hours of that I hopped back upstairs and crawled along the floor until I found a pair of crutches. I called the Medica NurseLine to get an objective opinion. From my description the nice nurse-lady suggested that I probably didn't need to go the ER but that I should go to an Urgent Care clinic as soon as I reasonable. In the meantime, she said I should continue the "RICE" treatment. Around 06:00 Andy woke up and we discussed what to do. Her opinion was that no Urgent Care clinic was going to be equipped to do anything other than refer me to another doctor. Since it was six in the morning on a Wednesday she suggested the ER would be dead (no pun intend... you know what? pun intended) and would probably be more useful. So that's what we did. She drove me to the Abbott Northwest ER and she was right: it was completely empty when I hobbled in. The triage nurse checked me in and sent me to an exam room. A couple of nurses, a doctor and a radiologist visited me over the course of the next hour. They took six x-rays and diagnosed me with a calcaneal fracture. They applied a plaster splint, sold me a bottle of Vicodin and referred me to an orthopedic clinic. It's worth noting that every medical professional at the Abbott Northwest ER was courteous and efficient. I recommend their ER for your emergency room needs. Especially during week day early mornings. Upon returning home I immediately set up an appointment with Twin Cities Orthopedics for the very next day.